Most of these films are available on DVD over the internet – some are free downloads. For more information on films about Palestine, The Palestine Film Festival curates a huge library of films and organises an annual festival in London. 100 Years After Balfour is a new talking heads film made by Independent Jewish Voices. The film spells out the troubling legacy of the Balfour Declaration, challenging the notion that this year’s centenary is cause for celebration, given the grave consequences of the document for Palestinians above all. The film goes on to explain how the decisions of the British government in 1917 are linked to the establishment of the state of Israel in 1948, its fifty year occupation of the West Bank since 1967, and today’s political gridlock. 100 Years After Balfour features seven experts and activists: Professor Avi Shlaim, Professor Jacqueline Rose, Rabbi Howard Cooper, Professor Brian Klug, Antony Lerman, Barnaby Raine and Miri Weingarten. Watch on YouTube . visit Independent Jewish Voices website and the film’s FB page here. Nominated for 2010 Oscars, for best foreign film. Ajami is a run-down district in Jaffa where Jews, Muslims and Christians live in close proximity. Thriller plot is intertwined with Romeo-and-Juliet style story and gritty social issues. The direction and acting are so good that you empathise with all the key protagonists; you also gain some insight into what life might be like in the lower echelons of Israeli society. A four-part series produced by Al Jazeera on the expulsion of Palestinians in 1948. It spans the 19th and 20th centuries, including the British Mandate in Palestine and comes up to date, with the ongoing ethnic cleansing of Palestine. Arab, Israeli, and Western intellectuals, historians, and eye-witnesses provide the central narrative which is accompanied by archive material and documents, many only recently released for the first time. You can watch this for free here. A study of the Druze community in an often forgotten area of Israel occupation. The surviving communities find ways of forging lives enriched with music, dance and intrigue, despite the ever-present IDF forces. Bilel Yousef’s documentary Back to One’s Roots looks at the dilemma facing the Druze community in Israel by following the emotional struggle of Yaman, whose brothers and uncle lost their lives serving in the IDF. Co-opted by the Israeli state as a vulnerable and isolated community, the Druze have traditionally found employment in the army and police force, while remaining suspect in the eyes of many Israelis. Villagers’ peaceful protest to divert building of the wall through their village fields cutting off farming land from the villagers. Directed by Jamel Dallali. Produced by Al-Jazeera Documentary and the Palestine Return Centre. Describes the cycle of exile and expulsion faced by Palestinian refugees residing in Iraq. Following the US invasion of Iraq 35,000 suffered and were forced into exile once again. Elia Suleiman’s feature-length films: his surreal, award-winning Divine Intervention, about the occupation and Palestinian reactions to it, and The Time That Remains, largely autobiographical story of a family of ‘present absentees’ – the term used by Israelis for Palestinians who were not expelled in 1948, but who lost their homes. It begins in Nazareth, with the Nakba of 1948. Should people stay and resist, or flee, with the hope of returning when hostilities have died down? The film follows the lives of different members of the family who make different choices. Barghouti features Palestinian women in the Intifada, following their lives at home, in the field, hospitals, factories, classes as well as economy projects and popular committees to portray a living image of people’s lives in the Intifada. By Ahmad Habash. It is the first multiple award winning 3D animated film made in Palestine which revolves around a young adult who discovers a lump while examining herself and her attempt to seek medical help under occupation, while tackling the taboo subject of breast cancer. 2012, a heart-warming documentary, showing child enthusiasts determined to beat the Guinness World Record for mass kite-flying. 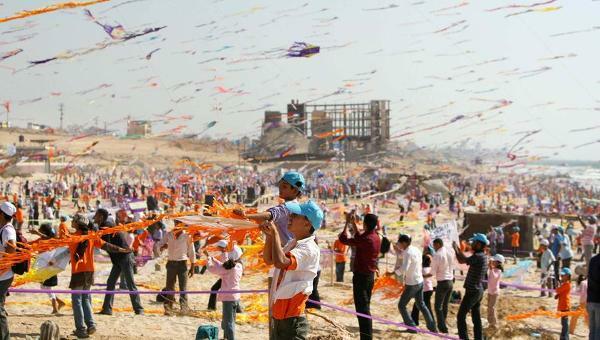 Around 8,000 boys and girls aged 10-14 flew 4,000 kites on a beach in the northern Gaza Strip. Two young men have trained fanatically for six years in the sport of ‘parkour’ which requires a supreme level of physical fitness and courage. We see them sprinting down the narrow alleys of the refugee camps of Khan Younis, somersaulting across rooftops, scaling three storey-high ruined buildings etc; for them, both an obsession and an escape. Available on YouTube. By Dima Hamdan. While Gaza was being brutally attacked by Israel in 2009 many Palestinians in the Diaspora watched in horror, helpless and frustrated, as their families were hit. 2012 documentary by Dror Moreh. 1 hr 37 mins. Director Benny Brunner. The story of the looting of 70,000 Palestinian books during the creation of the State of Israel in 1948. Five years in the making, the 57 minute film centres on eyewitness accounts and cultural critiques that place the book plunder affair in a larger historical context. 70,000 Palestinian books and manuscripts were systematically looted by the newly born state of Israel during 1948. The story of these books is at the heart of the film. Four athletes – two swimmers and two runners – were chosen to represent Palestine in the 2008 Olympics. Their training facilities were almost non-existent: eg the swimmer from Jenin, which has no swimming pool, could not obtain a military permit to get to nearby Nazareth. But they make it to Guangzhou for two months of training and acclimatisation before the games, adapting to a city of 20 million people and food they find truly bizarre. None of them achieve a medal but their efforts inspire huge pride at home. A clip of the film can be found on here. Key overview documentary by Mohammed Alatar, 52 mins, 2006. Shows the systematic Israeli strategy of stealing land and water resources and breaking up Palestinian communities with the wall. Also focus on settler violence in Hebron, with interviews with Palestinians and Israeli soldiers. “The best description of the barrier, its routing and impact is shown in the film The Iron Wall” President Jimmy Carter. Buy from our shop. Interviews with Alatar also on YouTube. Second major film by Mohammed Alatar, 2008. Shows the devastating impact of the Israeli annexation on the old city and its peoples, highlighting Israel’s racist demographic policies. Riveting interviews with former and present inhabitants of Jerusalem. Israeli director Yotam Feldman discusses his new film ‘The Lab’, about the Israeli arms industry: how Palestinians are used as ‘guinea pigs’ and how attacks on Gaza are used to showcase Israeli arms and methods. 2007. Documentary showing the late 19th century birth of Zionism—and its repercussions for Palestinians in the C20—with original source documents, rare archival footage, testimonies of witnesses and interviews with historians. Shows that the expulsion of the indigenous Arab population from Palestine was far from an accidental result of the 1948 war. This award-winning film shines a spotlight on the ethnic cleansing of Palestine by the Zionist movement. On DVD 60 mins, narrated by Nur Masalha. By Israeli director, Yotam Feldman. Looks close-up at the Israeli arms industry which markets its products as ‘field-tested’. Available to rent via vimeo. By Ra’anan Alexandrowicz 2011 award-winning Israeli documentary about the military court system in operation in the West Bank. Interspersed with archive material, it is based on interviews with nine retired military judges who speak with remarkable candour about the use of torture, and their belief that “security is above the law”. 2011. Funny/sad film of young Palestinian Israeli who clashes with his curmudgeonly olive–farming father, who believes an Israeli cell phone mast is poisoning the villagers with radiation. Brilliant half-hour film (free download from www.jahalin.org) about the plight of Bedouin facing imminent eviction under the shadow of the huge settlement of Maale Adumim in the West Bank. Contrast the life of the illegal settlers with those of the Bedouin. Interesting comments from an Israeli HR lawyer. A documentary giving a history of occupiers and occupation, focussing on Palestine. A teacher’s guide for the film is downloadable for use in high schools, colleges and universities from www.occupation101.com. A film by award winning Palestinian documentary-maker, Leila Sansour, about her return to the small town of Bethlehem to document the building of the Wall. Magical. Excellent film for those new to the issue. Buy from our shop. By Dr Mustafa Barghouthi and the Palestinian National Initiative. The Palestinian situation from 1947 to the present day with special focus on the Apartheid Wall. Critical source of information for scholars, journalists, students, and anyone seeking a balanced narrative on the Middle East conflict. By Ed Hill on the Return to Palestine for the Zaytoun Olive Harvest Trip 2006 and non violent resistance to the occupation through the eyes of Palestinian olive farmers. A documentary about the journey of a British University football team who are transformed by the events they witness in Egypt and Palestine. 12-min film produced by students of Bir Zeit University. Problems of access and of telling the story of Palestinian history and geography in school curricula. On youtube. 2004 film directed by Saverio Costanzo. A psychological drama about a Palestinian family of seven suddenly invaded by Israeli army who confine the family to a few downstairs rooms in daytime and a single room at night. Peter Kosminky’s four-part drama shown on Channel Four in 2011 was a great critical and popular success: if there is one TV series you must watch about Palestine, it’s this! Tells the story of the run-up to the Nakba in 1948 through the eyes of a British soldier, interleaved with the visit of his granddaughter who tries to find the Palestinian family he befriended, 60 years later. Lots of info online and you can watch clips here. Available on DVD. By Annemarie Jacir. A romantic drama about a working-class woman and her experiences of travelling back home. By Jackie Reem Salloum, Rumzi Araj, Waleed Zaiter. A musical docu-drama featuring the first Palestinian Hip Hop band, DAM. This film takes a fresh look at the occupation, exploring the hopes and aspirations of young Palestinians in the West Bank, Gaza and those in the Diaspora. Harrowing documentary on the fate of families during and after Operation Cast Lead, 2008-2009, shows how women and children handle their everyday life after a terrifying war experience. Many of them live in tents or in ruins without walls or roofs. The film follows three children through the war and the period after the ceasefire. Available on DVD. 22 mins, 2013. Omar Robert Hamilton’s debut drama, in which a returnee to Palestine faces an impossible choices, between a passport for his unborn child and a safe haven for his activist brother. Sawsan Qaoud’s Women in the Stadium looks at the burgeoning world of women’s soccer in Palestine, with four pioneering players telling their personal , inspirational stories. The first film about Gaza made by Palestinians living the reality of Israel’s siege and blockade of this tiny enclave. It is the story of two young women, survivors of Israel’s Operation Cast Lead. Mona Samouni, now 12 years old and the filmmaker, Fida Qishta, represent the spirit and future of Palestinians. The film is a visual documentation of the Goldstone Report. But it is so much more. It reveals the strength and hope, the humanity and humor that flourishes among the people of Gaza. Few films document so powerfully and personally the impact of modern warfare and sanctions on a civilian population. Buy from our shop.